The Mid-West Carts unconditional, 1 year, no questions asked guarantee. 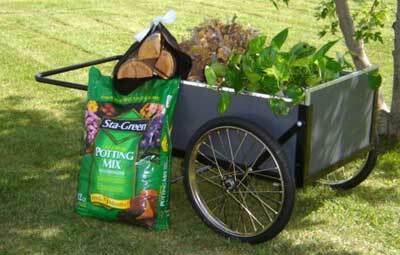 The Model 20 Garden Cart is a versatile midsize garden cart, just right for general yard and garden chores. This cart will handle heavy loads, while the extendable handle allows for better leverage and use by adults or children. Dimensions Inside: Length: 41" Width: 23" Depth: 12"
Dimensions Overall: Length 52.50" Width 31.50" Height: 21.25"
The Model 20 garden cart has a removable front panel for transporting longer objects and a fully welded front gate assembley for strength and stability. All metal components are galvanized and plated steel for rust resistance and strength. All products from Mid-West Carts include a one-year unconditional guarantee.